Mihong, a fictional country in the Pacific Ocean theater, during the 1940s—assume the role of an intel operative taking encrypted orders from your commanding officer and wiretap a political figure’s household phone following the aftermath of a civil war. Follow the case of Vera Song & Poppy Hara via phone calls as the sisters find themselves aligned on opposing sides after the war. Operation Kanshi, March 2019 prototype. Operation Kanshi, December 2018 prototype. 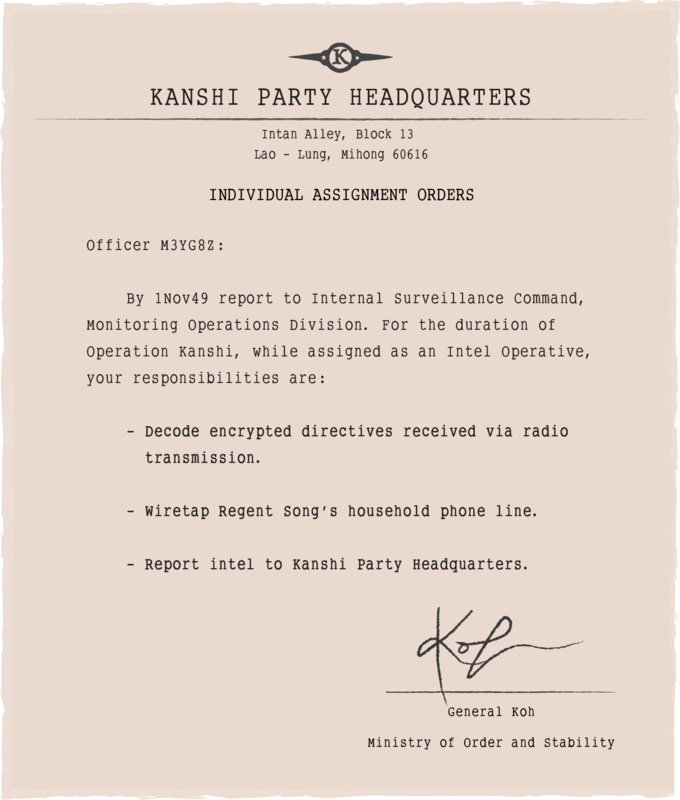 How to Play: Decode an incoming message from your commanding officer, listen in on the wiretap at the Song household, send report to commanding officer. Main inputs are the mouse and keyboard. Our latest devlog post talks about the issues we encountered with the design & execution of this particular build. Special thanks to Chris Kindred and Claire Carré for helping us out with voice acting on the latest prototype. The November 2018 prototype is no longer available! 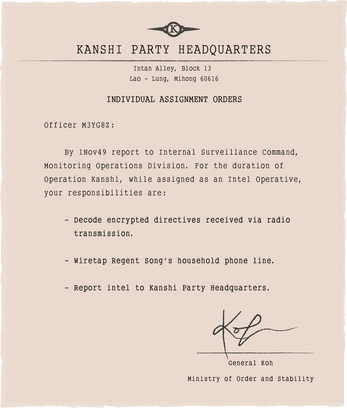 Operation Kanshi, November 2018 prototype. How to Play: The decoder in the scene blinks when there is an incoming message. Use the mouse to click on the decoder to play the incoming message, and follow directions. You can only use the keyboard while the audio plays. There is currently no end state.